THIS WEEK’S OTHER FEATURED BOOK, “SKATING FOR GRACE,” BY ANNE PERRAULT, CAN BE FOUND, ALONG WITH THIS MONTH’S “FIRST TUESDAY REPLAY,” BY SCROLLING DOWN BELOW THIS POST. OR, JUST CLICK ON ANNE’S NAME ON OUR AUTHOR PAGE. 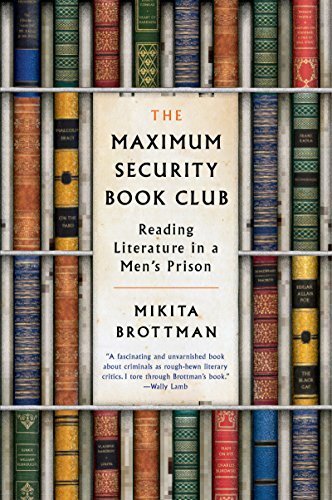 THIS BOOK: The Maximum Security Book Club: Reading Literature in a Men’s Prison. THE PUBLISHER: HarperCollins. 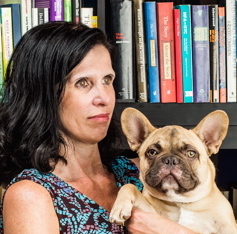 Terry Karten at HarperCollins had bought my previous book, The Great Grisby, a book about my French bulldog and the dogs owned by famous dog lovers, both real and fictional. So HarperCollins had rights of first refusal on my next book too, and luckily, Terry liked it. SUMMARY: The book recounts the three years I spent running a reading group with nine male convicts in a maximum security prison in Jessup, about ten miles outside Baltimore. Since I’m a literature professor, I wanted to see what they would make of my favorite works of literature. We read Conrad, Melville, Nabokov, Shakespeare, Poe — a lot of heavy and serious books. Sometimes it worked and sometimes it was a struggle. But it was always fascinating — for me as much as for the men. THE BACK STORY: I started the book club when I was on sabbatical. About six months in, I realized the men’s responses were so interesting and engaging and I was learning so much from them, I started to think that other people might also find this experience as compelling as I did. So I started making notes during our sessions and thinking about writing a book. I wrote the book during the process of the club, and showed the final draft to the men. For the most part, they loved it. WHY THIS TITLE? : There were a lot of “Book Club” titles around at the time – The Jane Austen Book Club, The End of Your Life Book Club, The Bridesmaids’ Books Club, The Mother Daughter Book Club, and they all have this warm, domestic, feminine feel which the idea of the book club does tend to have. So I thought my title made a nice ironic contrast. WHY WOULD SOMEONE WANT TO READ IT? I think my experience was unique. It’s a personal narrative. It’s very honest. I’m frank about how my expectations were upended, what I did wrong, what I would have done differently. I don’t think it’s so much a book for people interested in prisons and justice. I think it will resonate with people who read a lot, who love classic literature as well as other things, who are open-minded, and who like personal narratives. “This memoir’s energy emanates from Brottman’s sharp understanding of group dynamics and her determination to avoid clichés. She delves into the personal stories of the men she met behind bars, and is clear-eyed both about literature’s powers and its limitations.” (Los Angeles Times). “Swiftly and sensitively written…we should all strive to build book clubs with people whose days and life histories are quite different from our own, rather than discussing books mainly with our friends. Until then, there’s Mikita Brottman’s wonderfully witty and deeply honest report from just that sort of space.” (Sheila Heti). “One of the best books about teaching I’ve ever read, it is not only lively and engaging from the first page to the last, but dazzles by virtue of its honesty, sympathy and humanity.” (Phillip Lopate). “Steers clear of facile sentimentality. There is no transformation or redemption in Brottman’s story, only honest moments of encounter…made possible by the act of reading literature. Brottman gives us a candid, unillusioned account of her work behind bars. A brave and admirable book about a brave and admirable project.” (William Deresiewicz, author of EXCELLENT SHEEP: THE MISEDUCATION OF THE AMERICAN ELITE). AUTHOR PROFILE: I was born and raised in England. I have a D.Phil from Oxford University in English Language and Literature, and I am a certified psychoanalyst (send me your dreams! I collect them at Vas Hermeticum). I’m a professor of humanities in an art college (MICA) in downtown Baltimore, were I teach courses on the uncanny; the history of true crime; and animal magic. I also do some independent forensic work. I live in the old Belvedere Hotel, with my partner, the movie critic David Sterritt, and our popular and charismatic French bulldog, Oliver. You can read a profile of me and my work published in the Baltimore Sun by Mary Carole McCauley; or check out at this article by Mark Dery at Boing Boing. My new book, a work of true crime about a mysterious unexplained death, is coming out from Henry Holt in September 2018. If you live in the Baltimore / DC area, you can hear me read from The Maximum Security Book Club on June 11 along with lots of other great authors at Books in Bloom, The Chrysalis at Symphony Woods, 10475 Little Patuxent Parkway, Columbia, Maryland. 12.15-1.00pm. LOCAL OUTLETS: Baltimore has some fantastic independent bookstores. You can probably find a copy in Atomic Books, Red Emma’s, The Ivy Bookshop, or (used) in Normal’s Books and Records. WHERE ELSE TO BUY IT: Amazon. Any online bookstore. PRICE: The hardback is $26.99, but the paperback will be out on June 6 for $15.99. “Read the Introduction Here,” and it will download as a pdf.